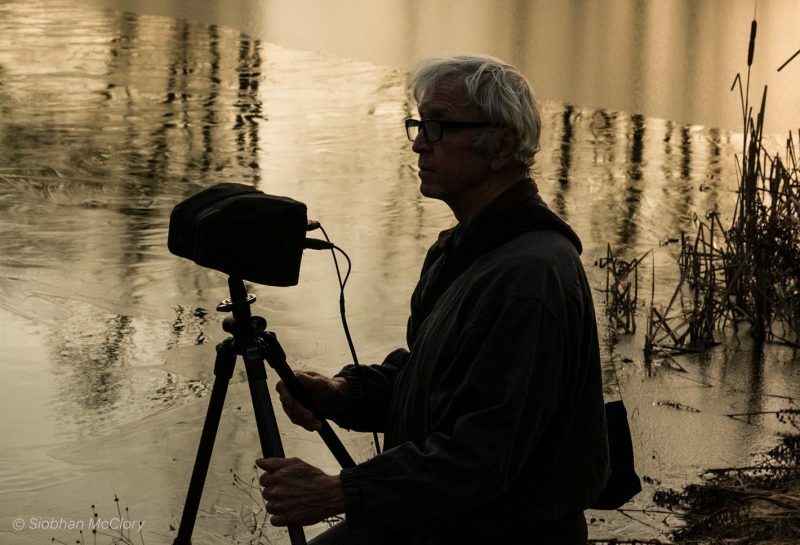 Nature author, speaker, cinematographer, sound recordist, photographer, and generous contributor of soundscapes to our Sound Sanctuary, Lang Elliott, shares the arc of his experience recording the sublime sounds of nature. Here is one of his immersive binaural recordings from a remote canyon in Arizona that you might enjoy listening to while reading his essay. Dawn at Willow Narrows. Aravaipa Canyon in southeastern Arizona. May 1, 2017. © Lang Elliott. Please listen using headphones! I’ve been recording nature for nearly 30 years. 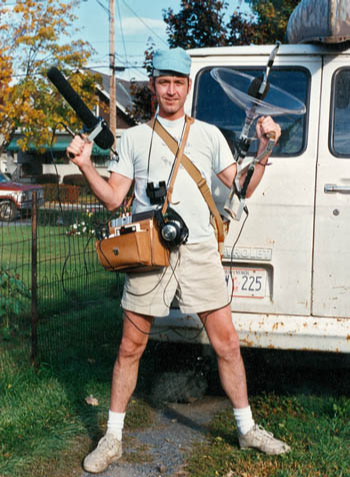 Early in my career, my primary goal was to capture close and clean recordings of particular species with the help of highly directional microphones. The object was to extract a species’ song from its surroundings, thereby minimizing ambient sounds and isolating the song for clear and unambiguous listening. Such recordings are incredibly useful when it comes to training people to recognize species by their sounds. 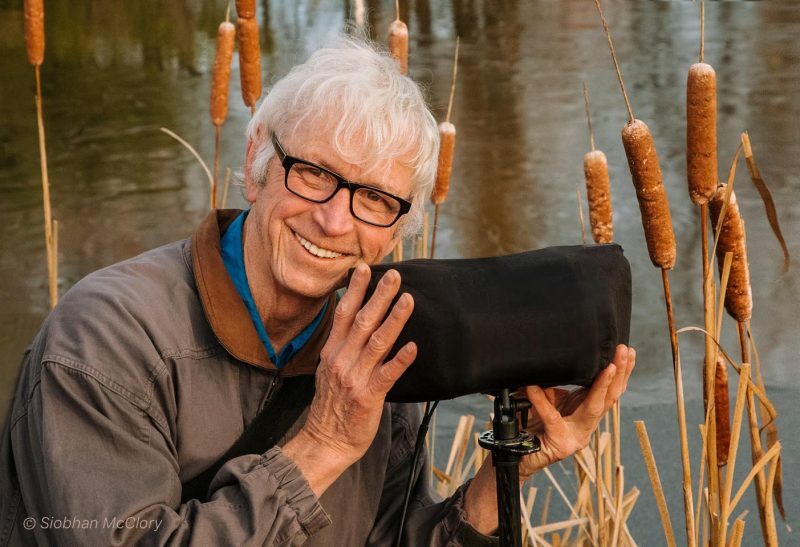 I excelled at this process and not only published a number of my own guides to wildlife sounds, but also provided recordings for museum and nature center exhibits, as well as for movies and a variety of other projects. Chasing after species and getting closeup recordings was a lot of fun and involved numerous expeditions to wild areas. The joy of the hunt and capturing each animal’s voice was truly satisfying. Nonetheless, over time, I found myself growing bored with the extraction-approach to nature recording and instead began to focus on the natural soundscape as a whole, on the full orchestra of sound flowing to my ears at any particular time and place. I became interested in the aesthetics involved, on what made natural soundscapes beautiful and uplifting, and on what constellations of sounds affected me in positive ways. In order to share my perceptions with others, I began looking for an appropriate microphone technology that would allow me to capture and convey spacious 3D ambient soundscapes. After considerable research, I homed in on the “binaural” recording technique, which utilizes special dual-microphone setups that usually resemble the human head (mine actually looks a bit different … see photo below). Binaural recording works by capturing the same spatial cues that our brains use to determine distances and directions of incoming sounds: 1) time arrival differences of sounds between the two ears, 2) intensity differences, and 3) phase differences. If a binaural microphone is properly designed, the resulting two-channel recording contains all the necessary information to re-construct a three-dimensional sound-field that closely resembles the actual outdoor listening experience. The only catch is that one must use headphones in order to enjoy the effect. Why? Because it is imperative that the left ear hears only the sound recorded by the left microphone and the right ear hears only the sound recorded by the right microphone. In other words, the two channels must be kept completely separate. When headphones are used, such separation is accomplished, and binaural recordings impart a sense of spaciousness that is shocking in its realism. How fortunate I was to have discovered this splendid recording technique! Equipped with my trusty binaural microphone, I began exploring wild areas across North America in search of pristine natural soundscapes. I visited forests and prairies, high mountains and deserts, southern swamps and northern lakes, ocean shores and seabird islands.These travels heightened my already deep appreciation for the wonders and beauty of this extraordinary continent. Altogether, I traveled over a half million miles, collecting hypnotic earth sounds such as thunder, wind, rain and waves, along with rousing dawn choruses and the mysterious voices of the night. 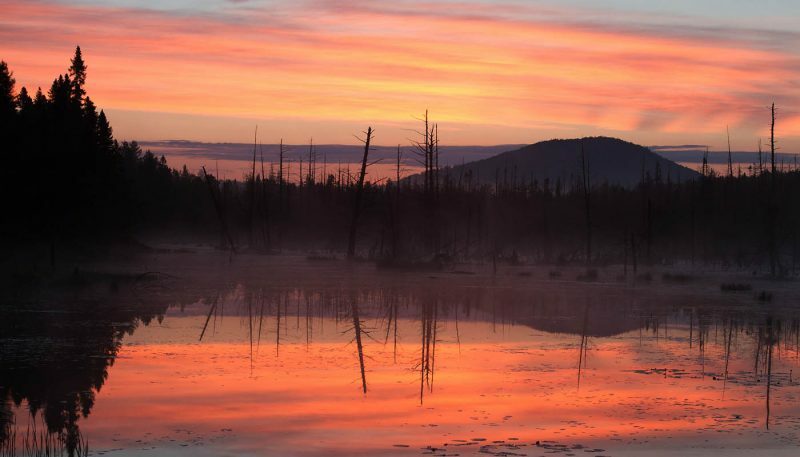 I head into the wilds in search of immersive and atmospheric soundscapes that are transportive, relaxing, and that have a tonic effect on one’s body and mind. Through repeated, in-depth exposure to nature’s melodies, I soon developed a deep appreciation of their healing qualities and came to regard myself as a “sound healer” of sorts, with a focus on the voices of nature. I likened myself to an herbalist who goes into the forests and fields in search of medicinal herbs … but I head into the wilds in search of immersive and atmospheric soundscapes that are transportive, relaxing, and that have a tonic effect on one’s body and mind. Not every natural soundscape has healing qualities. Some are too cacophonous. Others are dull and constricted. And many are polluted by the sounds of human machinery, barking dogs and the like. It’s not easy to find the right balance of sound … audio celebrations that touch and move us at the deepest level. In large measure, my work is intuitive. There is scant research on the healing qualities of natural soundscapes and studies of aesthetics are rare. So I’ve had to develop my own language of appreciation and come to trust my inner promptings as I move about in the wilds, microphone in hand. To listen deeply, it has been necessary for me to quiet the chatter in my mind so that I can feel the subtle effects of what I am hearing and become more attuned to the extraordinary music that surrounds me. Collecting natural soundscapes has been my passion for 20 years now and I’ve worked very hard to amass a large collection of high-quality binaural recordings from a wide variety of habitats and locations. My immersive 3D soundscapes literally “speak for themselves.” Many are supremely meditative, calming and sublime, perfect for inducing relaxation and a healing response. Others are engaging, captivating and awe-inspiring, and provoke a sense of amazement at the powerful auditory expressions of wild nature. I am also confident that the vast majority possess an artful quality, the result of careful microphone placement in remote natural areas where one can still experience relief from the incessant noise of civilization. Each and every day I reflect on my journey and feel grateful to be here now, still doing work that I love. I feel so very fortunate to have found work that resonates deeply within. While it has often been a struggle to make ends meet, I have never doubted my path, that it is the one I was meant to follow. Each and every day I reflect on my journey and feel grateful to be here now, still doing work that I love. I also feel fortunate to have found a way to share these binaural soundscapes more broadly through a beautiful and accessible format. It is with great joy that I recently published Pure Nature – 3D Soundscapes, a free application for Apple mobile devices that features a large collection of my finest and most immersive binaural sound recordings. Hallelujah … my labor of love has found its way into the world! As you can imagine, I am very pleased with my new creation. I consider it to be a gift of sorts, from me to you, and a heartfelt invitation to immerse yourself in the healing voices of the natural world. P.S. If you would like to experience the soundscapes in my new app and are using an iPhone or iPad, you can download it now by clicking the button below, which will automatically open the App Store. If you’re using a laptop or desktop computer (or an Android mobile phone), you will be taken to Apple’s web page where you will find a more detailed description. Thanks! Thank you, Lang. As always, your soundscapes and videos leave me enchanted. I have no doubt that your offerings will continue to be healing for many. It is heartening to read how you have made your path by walking. My best wishes to you. Thank you grateful sea. Now that I’ve completed the app, I wonder what’s next. Maybe I’ll go back to focusing on cinematography and sound, a multimedia immersion and celebration of the natural world. You’re welcome Margaret … let me know if your son likes the binaural experience. The night cry of the Limpkin … one of my favorites, conveying the untamed wildness of the Florida swamplands. Dear Lang,thank you so much for sharing this with us! „Your“ sounds help me to become quiet and to feel fine and secure. Maybe you don‘t know the German biologist and moviemaker Dietmar Keil, but he made wonderful movies about nature. You can see there landscapes and animals and hear beautiful sounds similar to yours. I am so happy that there is a forest nearby my home so I can go there and cool down and listen to the birds and the water and the wind in the trees…Dear Lang,thank you so much dor sharing this with us! I am so happy that there is a wood nearby my home so I can go there and cool down and listen to the birds and the water and the wind in the trees. Korakas: I am not familiar with Dietmar’s work, but will google him shortly. I too am a cinematographer and hope to create immersive nature movies in the years to come. In fact, I may jump headlong into movie-making this coming spring. He is not very famous and his movies aren‘t easy to buy, I don‘t know why because I love them. I have bought the DVDbox many years ago. I think he is an old man now. That sounds great with your movie-making projekt! Please tell us if you have published something! Good luck and success for this. I found some examples on YouTube. Interesting work for sure! Dear Lang, thank-you so much for sharing this! It is beautiful and healing! It is snowing lightly right now and the gentleness of the snowflakes falling to the ground, has a “music” all its own! Thank-you for inspiring me to be more attuned to nature! You’re welcome Sheila. It’s supposed to snow like crazy tomorrow, here in upstate New York. Maybe I’ll head into the field to get a recording of the sound of snowflakes hitting objects, perhaps the persisting leaves of beech trees in the understory. What a beautiful recording, and a special project! I think this would especially be a wonderful thing for someone who is ill in bed and unable to get out into the wild. Thank you for doing this. I think binaural immersion would be great nature-therapy for people who can’t get outdoors. Although scientific research on the effects of nature sounds on listeners is sparse, the few studies that have been performed show noticeable effects, such as lowered heart rate, lowered stress hormones, and the like … in other words, a stimulation of the parasympathetic nervous system (rest and relaxation) and a corresponding suppression of the sympathetic nervous system (fight and flight). In my estimation, binaural recordings are “strong medicine” when it comes to nature recordings, and I hope that scientists eventually do in-depth studies of their effects. This is amazing and inspiring. I have seen this gentleman’s content on the site before but this is the first time I am inspired to record in nature myself. Not yet but might be a future pursuit. Gonfu: If you decide to start recording, I’m available to advise you about gear. For this excellent article in which the Love and Joy adventure and discovery of Beauty shines through very, very well. I am one of those who sees, ‘colours in sounds’, and hears, ‘sounds in colours’, so works such as yours are “music to my inner eye”. ( from the Noetical on up sound and colours are simply vibrations, there is no way of defining them as “separate” ). So I can recognize and wholeheartedly agree with your point re: reasearching “sound within nature for healing” as very important to overall human health. Best Wises that your work will flourish in all potential healing areas. It is very important to mankind that it does! Thank you Ed! In my mind, the “music” of nature is actually a full-on multi-sensory experience that simply cannot be replicated by technological instruments. My soundscapes are but a small slice of the whole, delivered via speakers (headphones in the case of binaural recordings). Nonetheless, they can have a positive, multi-dimensional effect on the listener … one sense somehow expanding into the others. Absolutely Laing …there is so much to this subject it wouldn’t be practical to go into here. Sufic it to repeat the mis-understood words of one with full ability to “hear”…”those who have ears to hear …hear!” , Yes there are the two physical “ears” which have extraordinary abilities to hear ..and there are many other “levels” and “ears to hear” beyond those as well. “multi-dimensional” indeed…if humans would return to the levels they are capable of …same as those of those of natures creatures that would be a start towards ” multi-sensory expanding into others”. A vast world/ “kingdom” to return too again!